We would like to welcome you to Las Olas Ecuador. We have a special bond with this beautiful property on the Pacific coast of Ecuador. You see, this oceanfront community is not only a labor of love it is also going to be home for both our families. When we found this absolutely stunning location, over 1,500 acres with the most breathtaking undisturbed coastline you can imagine, we both immediately fell in love. From spectacular cliffs and volcanic sand beaches to regal forests and magnificent mountains, this property has all we were searching for. Consistently voted as one of the best places in the world to retire, Ecuador is quickly becoming the number one choice of North Americans, Europeans and of course Ecuadorians to retire. Las Olas is the first development designed specifically to make everyone feel comfortable, secure and a welcome member of the community. Las Olas offers you the opportunity to live in one of six unique yet complementary communities. Enjoy seaside living at its best. Play a world-class links golf course with stunning views of the ocean or go riding on one of the many lush trails branching from our equestrian center. Go deep sea fishing or if you prefer, fish right off the beach. 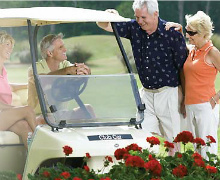 Relax in our elegant spa or play tennis or pickle ball at the club. Fill your days with an active community of friends who share your dynamic lifestyle and sense of adventure. Whatever lifestyle you wish to enjoy, we would just like to say, welcome to our home.